Here in Perth, our sandy soils are very ineffective at holding water and with our hot, dry summers water repellency is an on-going issue. In addition, the sand which makes up the majority of gardens both in metropolitan Perth and many regional areas of WA, is devoid of most nutrients and organic matter. It needs improving considerably to ensure plants thrive, and that water used on the garden is used with maximum efficiency. Ideal soils for gardening are loamy soils. Loam is the term used to describe soils which are a mixture of sand and clay particles. Loam is the ideal growing medium because it contains a range of different sized particles, which allow for water and air to penetrate, and room for plant root hairs to grow. How to improve your soil? If you want to know how to improve sandy soil into good garden loam, you need to add clay to improve the garden's soil. This is where Sand Remedy comes in. One of its active ingredients is a naturally occurring clay mineral which can hold many times its own weight in water. The mineral particles bond with sand particles meaning this unique water holding ability stays locked into your soil and creates a ‘crumb structure’. These ‘crumbs’ hold nutrients, air and water in a structure that is ideally suited to plant roots - an ideal soil amendment. The unique blend of six minerals in the mix also work to hold nutrients by a process known as cation exchange. Clay particles are negatively charged, so have a natural ability to hold on to positively charged particles (called ‘cations’ (pronounced cat-irons) like nitrogen and potassium, making them available to plants as required. The ability of Sand Remedy to keep nutrients in the soil prevents leaching of these soluble nutrients into our waterways, reducing algal blooms and pollution of our wetlands. Sand Remedy also contains trace elements, beneficial microbes and a food source for them. This is to ensure that colonies of these microbes will thrive, and help establish the most ideal growing conditions for your plants. It is these microbes which make many nutrients available to plants in a form they can use, and aid in keeping moisture in the root zone, where it is needed. Elements provided by Sand Remedy include: Nitrogen, Phosphorous, Potassium, Calcium, Carbon, Magnesium, Sulphur, Silicon, Iron, Coppper, Zinc, Manganese, Boron, Cobalt, Molybdenum and Selenium in a balanced, slow release form. The carefully researched blend of minerals in Sand Remedy work together to ensure your garden can be as water wise as possible. Soil treated with Sand Remedy will grow plants that show a marked increase in drought tolerance and pest/disease resistance. Soil may still become dry over our long summers, but is much easier to re-wet, acting like a sponge. We always recommend an on-going soil improvement program to improve soil structure by adding organic matter (eg. Aged manure, compost, etc). For healthy plants, feed the soil! Conserving water in our dry climate is crucial. There are many ways we can all reduce our water use in the garden - Sand Remedy is one product which will help. Improving the soil prior to planting (if you have sandy soils particularly) is important. Contact us if you would like more information on water wise gardening. 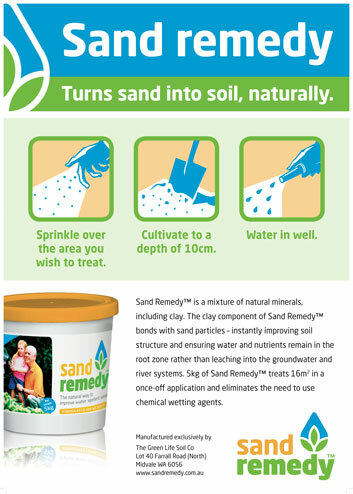 Sand Remedy is made in Perth by The Green Life Soil Company, and has been since 2001. It is Certified Organic by NASAA (National Association for Sustainable Agriculture Australia). The Green Life Soil Co, makers of Sand Remedy have been selected as finalists in the 2011 & 2012 WA Environment Awards - Small Business Leading by Example category. Let us introduce ourselves and Sand Remedy in this short video. See 'Directions for using Sand Remedy' for tutorial videos on using the product. Improving the soil prior to planting (if you have sandy soils particularly) is important - Sand Remedy can help. Sand Remedy adds to the water retentiveness of your soil. Visit our Test Results for details. If you are using Sand Remedy to improve the soil in an existing garden, gently remove mulch to one side. Sprinkle Sand Remedy over the top of the soil, and using a small trowel, shovel or fork, lightly turn it through the top 10cms of soil in light movements. Take care not to disturb plants, or to chop through roots you may dig up. Watch our video and we'll show you how.